The Wisdom of Kabbalah teaches that the Creator is infinite and His only will is to do us – all the creatures in the Universe – good. Also it is taught, that our future is determined by the Universal truth of “cause and effect”. Meaning, a positive act will lead to a positive consequence and vice versa. Hence, we and we alone determine the “script” of our lives. The Zohar tells us that every year, in the month of Tishrei, we receive an opportunity to recreate ourselves and to receive the infinite abundance offered to us by the Creator. The Kabbalists say that in the month of Tishrei a gate to a higher dimension, to the Universal storage of Life Energy is open to us, and allows us to draw blessings and abundance, so we can create and design our lives from the beginning once more. Obviously then, the month of Tishrei is one of the most important months with all of its special holidays. It is during this time that special forces exist in the Universe, to assist us in our process of re-creation, rejuvenation and re-designing our destiny for another year. 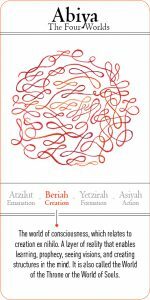 Sefer Yetsira (The Book of Formation, written by Abraham the Patriarch) deals with the structure of the Universe. Its secrets explain that our Universe was built on 22 frequencies which are considered to be the building blocks of the Universe. Those frequencies are represented by the 22 Hebrew letters and they are used as conduits for transferring spiritual abundance. According to Kabbalah, each month is controlled by two Hebrew letters; one controls the planet that dominates the month and the other controls the astrological sign of the month. Tishrei’s planet is Nogah (Venus) and it is controlled by the letter פ (Peh) while the astrological sign of Libra is controlled by the letter ל (Lamed). The zodiac sign Libra is visually represented by a scale, that symbolizes the special time in the Universe in which our good choices are being measured against our bad choices. Libra is an air sign and it represents central column energy – the power of balance and thinking. Hence, equilibrium and justice are Libran characteristics. The structure of the letter Lamed, that controls the month of Libra, connects us to the upper spiritual world. It is the only Hebrew letter that goes above the line, directing us upwards –connecting us to the upper world – the source of our existence. This letter also has the special ability to connect us to the world beyond/above and to draw from it knowledge and strength. An indication of the power of balance that lies within the letter Lamed lies in its shape. It has three parts that represent the three forces of the Universe – Left column energy (the desire to receive ), Right column energy (the desire to share), Central column energy (the power of balance, the desire to receive in order to share). Similarly, the organ in our body responsible for balance – the ear – also has three arcs, and the same is true of the Shofar blasts on Rosh Hashanah; Tekia (Right column energy), Shevarim, Terua (Left column energy), and the last Tekia blast of each sequence (Central column energy). The planet that controls Tishrei/Libra is Venus – the planet of love. This explains the essence of Tishrei, a month of love and forgiveness, a month in which we should “…love thy neighbor as thyself”. This is the consciousness that will allow us to connect to the power of “Life” during Tishrei, for the whole year to come. The word “Nogah” (Venus) in Hebrew is also “Light” and its numerical is 58, equals to the hebrew word “Ozen” (ear), which is also used as the root of the word “Moznaim” (scales – Libra). This is the place in which the power of love and balance of Tishrei meets. Unfortunatly this could also harm the Libras. Their special connection to these forces make the Libras very sensitive to their surroundings. Their ability to listen and to identify with the thoughts and emotions of their fellow man is very powerfull and could overwhelm them. If they will learn to use their abilities in a balanced way, they could be great diplomats or negotiators. They do not do well in a hypocratic, lying and non-harmonic environment. They love to love and want to be loved and in order to be in that state they might adapt a constant behaviour of changing their minds like a chameleon. This kind of behavior might be interpreted by others as them being non-authentic. The special sensitivity of the Libras gives them an almost supernatural intuition. However, being related to the air element – meaning, being very rational – can make their emotions be in conflict with their rationalism. Their constant inner dialogue is very exhausting and usually brings them into in-decisiveness which can lead them into making bad decisions. The solution is to remember that the secret of success is not always within the logic boundaries but in sensation. We mentioned before that being successful is being creative, having inspiration, devotion to our vision, etc. – meaning, having things that are not related and cannot be measured by logic, things that belong to the upper worlds. So too, Librans need to remember that the connection to those worlds is part of their natural God given abilities, thanks to the letter Lamed. Therefore, whenever the Libran feels exhausted due to their thoughts/too much thinking, they should connect to the spiritual Light, give it up to the Light. As mentioned, “Ozen” (ear) and “Nogah” (Venus), both equals to 58 that is represented in Hebrew by the letters נח (comfort) and if we turn them around it is חן (Grace). That implies of the Libras’ quality, in being adorable and to find favor in others and have others find favor in them. They have a tendency towards laziness and feeling comfortable. Therefore, when someone is full of light and prosperity and feels very comfortable, the chances he would change are very small. The Zohar teaches that the the letter פ Pe that created Venus has two faces. As mentioned, Venus is the planet of love, beauty and pleasures. On the outside (the black part) the letter פ looks like a snake hiding its head and poison. The Libra has a tendency to enjoy our world’s pleasures, material beauty and living a life of luxury and comfort. There is nothing wrong with this, however, we also have to learn to overcome the illusion of the limited physical world and connect to the power of the soul, to discern evil from good, which is our work on this physical plane. In doing this, we will find within the פ the letter ב – Bet (colored in white). The letter Bet symbolizes the power of blessing. So once again, for Librans and the rest of us, during this month of Tishrei, connecting to the power of balance is the goal. Libra helps us connect to the beginning of everything, to the root, the seed, to our source, to the beauty of Creation – to love, to the supernatural beauty and the harmony of Genesis. When we can see that everything is for the “best”, it will allow us to forgive and not to fear the past and the future. Knowing this allows us to come in clean and with a quiet conscience to Tishrei’s holidays. This will help us to get rid of suffering, pain and chaos in our lives, with the ultimate reward of connecting to all of the Creator’s abundance.